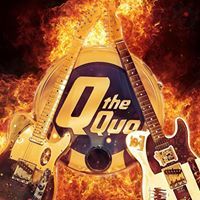 Q the Quo is a five-piece Status Quo tribute band, based in Northern Ireland, dedicated to bringing the musical magic and energy of the original rock legends to as many people as possible. Q the Quo are as close as you can get to the real Quo sound. Even though it’s fifty years since they rose to fame with their first hit, Status Quo's music is as popular as ever. Fans will never forget the powerful riffs played by the late, great Rick Parfitt, the amazing solo work of Francis Rossi and the unforgettable sing-along melodies and harmonies that have made the band a world class act over the past five decades. They've had more Top 40 UK singles than any other band or artist and even people who aren’t Quo fans will know more of their songs than they think. Members of Q the Quo all grew up listening to these songs and get a real kick out of playing a two-and-a-half hour tribute show in front of an always-appreciative audience.